Dibba Rock suffered tremendously when the red algal bloom plagued the UAE’s north-east coast in 2009. The bloom also referred to as a red tide killed tons of fish and other marine animals which transformed the area to an underwater cemetery of sorts. The coral reefs did not escape the wrath of the red tide and the dreadful effects of the bloom became more evident as coral bleaching occurred. Corals get their energy from the microorganisms living in their tissues but when they began dying due to lack of sunlight, the corals lost their major source of food. This resulted in the corals turning white and becoming susceptible to disease. It has been nine years since the onslaught of the red tide but nature always finds a way to pick up the pieces and come out strong again. Marine life at Dibba Rock is now flourishing and many species have returned to reclaim their rightful place in this underwater realm. Dibba Rock has bounced back from the devastation and is now back as one of the favorite dive sites in Fujairah. Dibba Rock is a small rocky island with extended sloping reef enveloped by soft and boulder corals. 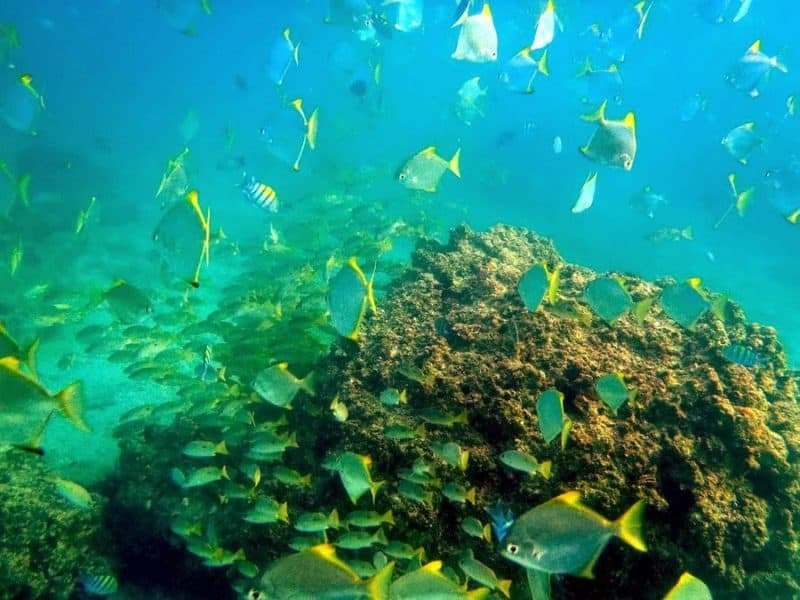 With varying depths between four to 15 meters, this site is ideal for both snorkeling and diving. Green turtles are commonly seen gliding in the waters of Dibba Rock. They are one of the largest sea turtles and they can grow up to four feet and weigh more than 400 pounds. These remarkable creatures are known to travel long distances between feeding grounds and the beach from where they were hatched. Although Green turtles have been classified as endangered due to their dwindling numbers in some parts of the world, it’s good to know that they have a high population in Dibba Rock. 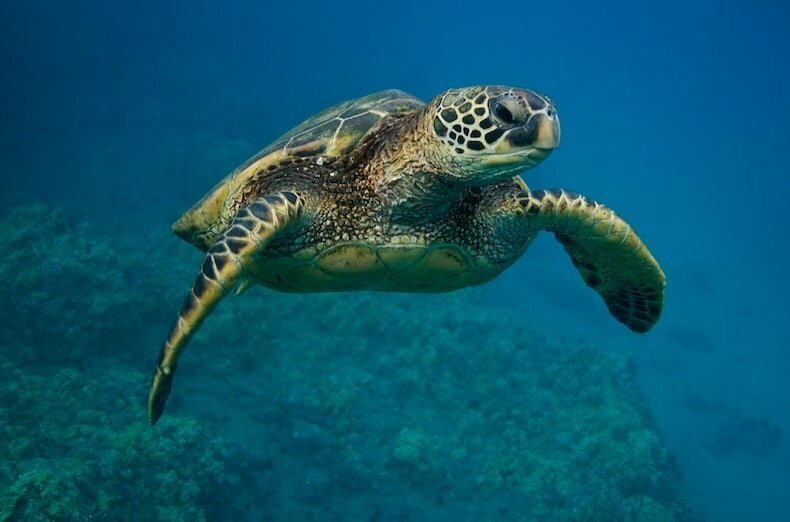 When you encounter a Green turtle cruising along the reef, the best way to approach it is by coming along its side and swimming parallel to it in order to match its pace. Swimming with the turtle in the same direction and allowing the creature to see you will imply that you are not posing a threat. As the turtle becomes more comfortable with your presence, you can ease a little closer while maintaining the same position on the side. If for some reason it decides to speed up to get away from you, it’s best not to pursue it to prevent the creature from getting stressed. Different species of rays are spotted in these waters including Eagle, Devil, Cowtail, and various Stingrays. 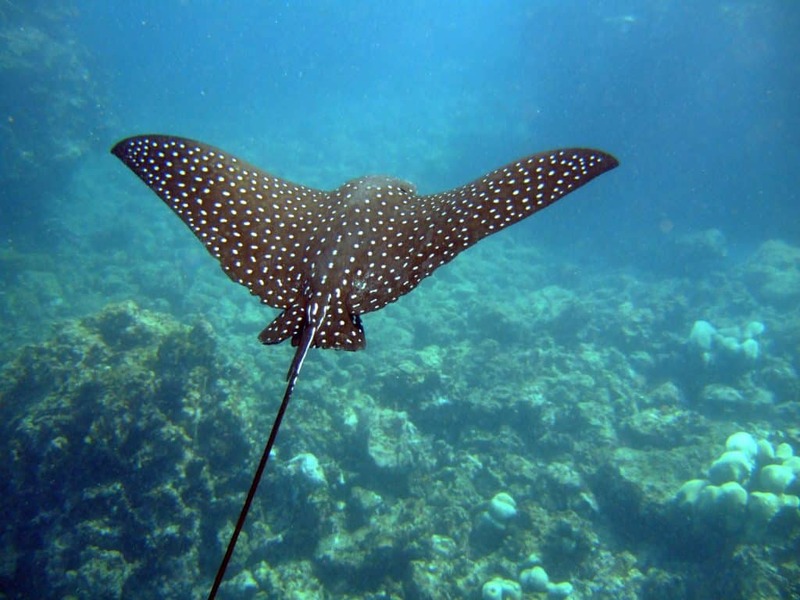 A Spotted Eagle Ray navigating along the open coast is truly an amazing sight with its majestic long wings soaring through the currents. If you’re lucky, you can witness one swooping down in search of food and scooping its prey. Devil Rays, despite its name, are actually harmless and shy creatures. Known for their surface acrobatic stunts, Devil Rays are lauded for their amazing high jumps, turns, twists, and belly flops in the air. You may come across the Cowtail, also called Feathertail Stingray which is named after its unusual tail. Stingrays are generally shy and peaceful marine animals unless they are startled or deliberately threatened. So when you come across one or a school of rays during your dive, it’s wise to observe them from a comfortable distance. There are many beautiful and interesting fish species in this part of the region such as the parrotfish, triggerfish, bannerfish, porcupine pufferfish, double-line fusilier, and lionfish. 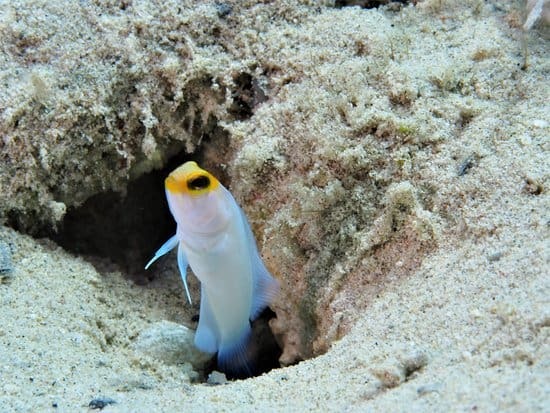 Pay close attention to the sandy bottom when you go diving in these waters for a chance to spot a peculiar fish called the jawfish which resembles a frog in a small hole. This fish creates a burrow in the sand and it uses its big mouth to stabilize the entrance to its burrow with rocks and shell fragments. Don’t be surprised if you see a moray eel sharing a burrow with a jawfish. You might also see morays slithering in the water or popping from a crevice. Have you ever encountered the chameleon of the sea? That’s no other than the cuttlefish which have made a remarkable comeback in the warm waters of Dibba Rock. Their special skin cells called chromatophores allow them to change the color as well as the texture of their skin in a matter of seconds to hide from predators, get the attention of a potential mate, or to ambush prey. Dibba Rock is also fascinating at night as strange creatures wake up from their slumber and come out to play. When you go night diving, you might come across extraordinary species of worms and crustaceans that you don’t normally see during the daytime. Rays, sharks, and barracuda are also active during the cover of the night which might trigger the interest of adventure-seekers. Book a dive at Dibba Rock to experience the captivating marine life first hand. There’s nothing like witnessing underwater creatures up close with your very own eyes.